(Bloomberg) -- Daimler AG raised its profit forecast for the Mercedes-Benz division for the second time in six weeks as the global recovery and China's booming market spur demand. 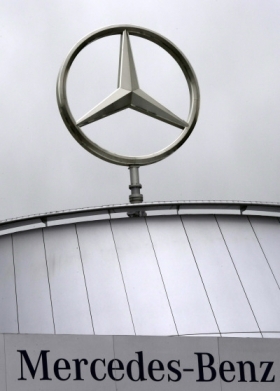 The unit's full-year earnings before interest and taxes will be at the “upper end” of the carmaker's target of 2.5 billion euros ($3.1 billion) to 3 billion euros, Daimler said today. Second-quarter Ebit will exceed the first quarter's 806 million euros, it said. Daimler, the world's No. 2 luxury car maker, is seeking to close the gap with luxury leader BMW AG and fend off Volkswagen AG's Audi. The Mercedes-Benz maker aims to gain market share this year by introducing an extended version of its full-size E-class sedan, its first vehicle targeted at the Chinese market. Daimler rose as much as 62 cents, or 1.6 percent, to 40.56 euros and was up 0.3 percent as of 9:33 a.m. in Frankfurt. The shares have gained 7.7 percent this year, valuing the carmaker at 42.6 billion euros. CEO Dieter Zetsche raised Ebit forecasts for the Mercedes-Benz and truck divisions on April 19. A week later, Daimler increased its group Ebit projection to more than 4 billion euros. Daimler's group profit forecast hasn't changed, spokesman Brigitte Bertram said in a telephone interview. She declined to say whether that outlook will need to be revised. Daimler will reach its goal of 10 percent return on sales at Mercedes-Benz in the second half of 2012 and maintain that level for the full year as of 2013 as the global economy recovers, the carmaker said. “Mercedes-Benz Cars' second-quarter production output of well over 300,000 vehicles will be close to the volumes achieved before the start of the financial and economic crisis,” Daimler said. The division has “significant advantages” including a better mix of products and pricing that may lead to a higher return on sales in the second quarter than in the first, the carmaker said. Daimler and luxury rivals BMW and Audi are benefitting from increasing demand in China, the world's largest automobile market. Deliveries of Mercedes-Benz vehicles in the country more than doubled in the first quarter. “China is increasingly becoming the center of gravity of the automotive industry and has recently become Mercedes-Benz Cars' third-largest sales market,” Zetsche said in today's statement.